It might be easier said than done, but Murray can be stopped. Nobody would dispute that DeMarco Murray is the engine that makes the Dallas offense go. His 449 total touches and 2,261 total yards from scrimmage would shoot down any critic that would try to prove otherwise. Murray had more touches than Tony Romo had pass attempts and his total yardage nearly doubled what Dez Bryant produced. He was and is a legitimate MVP candidate just about any way you present it. But as good as DeMarco Murray is, he's also mortal and stoppable, and at least two defenses have shown ways to get it done. Pro Football Focus is a remarkable resource. It's provided at least a rudimentary outlet for standardizing player evaluation in the media, if there can ever be one. But it's also not great at providing context. To wit: Murray had 28 carries for 115 yards and one touchdown against the Seattle Seahawks, a respectable outing against an excellent defense by any conventional measure. But PFF gave his rushing performance a -1.5 grade, his worst evaluation of the season by a wide margin. Why? Not because of his one fumble, which was fell out of bounds and was basically inconsequential when combined with a holding penalty on the same play. Not because of his low yards per carry average, which was really only low when compared to his other rushing performances of the year. Why then, was the grade so low? We'll never know, because PFF can't reveal the reasoning behind their numbers. To do so would eliminate the proprietary nature of their stats, and their profits right along with it. Murray also received a -0.2 rushing grade for his 32 carry, 179 yard, one touchdown performance against Chicago, and we'll never know the reason behind that grade either, for similar reasons. We can, however, speculate as to the reasons for these grades with film study, and that's what I'll try to do here. Film study and speculation are inherently dangerous, of course, so take whatever I say here with a grain of salt. In summary of what I'm about to say, I think Seattle stuck Murray with a negative grade because they made him think about his cuts. Dallas tries a pretty simple zone run to the right, but the entire Seahawks defense flows in front of the Dallas front, forcing Murray to choose between cutting back on the zone or continuing to string it out. He eventually chooses...neither one. Murray runs into his own blocker and is stopped for no gain. Perhaps slowed a little bit by the counter action, Seattle is a little bit slower to get out in front of Murray on this one, and he steamrolls ahead for eight yards. This is the kind of successful run you see often from Murray. He's not shifty like LeSean McCoy or Jamaal Charles or a freakish athlete like Adrian Peterson, but he is really good at following his blocks, and I don't mean that as a kind of backhanded compliment. 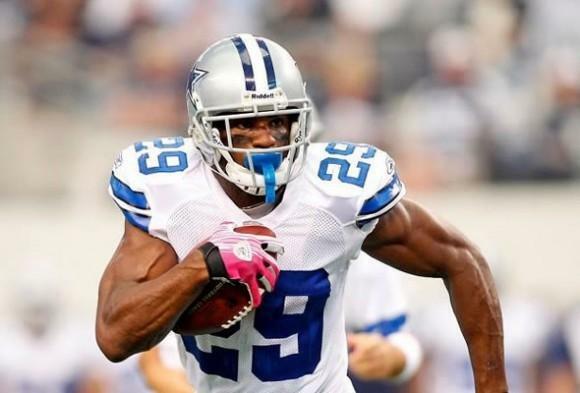 If there's a better way to slow down DeMarco Murray, I don't know what it would be. Seattle's defense flows faster than the zone run to the left, it's primary defenders soak up the blocks, and Bobby Wagner slides in and finishes the job. Now, if that's the book on taking down DeMarco Murray, the Packers can certainly follow it. It's not that complicated. Few things in football really are when you actually break them down. My question, if I'm diagnosing how to stop Murray correctly, is if the Packers have the horses to pull off what Seattle did. Much of what the Seahawks do well here is predicated on players like Cam Chancellor, a safety, taking on blocks at the point of attack. Can Morgan Burnett and Ha Ha Clinton-Dix pull that off? Can linebackers other than Clay Matthews stand up to the Cowboys' punishing run blocks, freeing up space for other linebackers to roam? Can Julius Peppers be effective against the run?